Not too long ago I would teach English to a bunch of young Cambodians. These guys would ask me lots of questions about life in Canada. And through these questions I discovered that a lot of young Cambodians have no real idea what western democratic life is like at all. 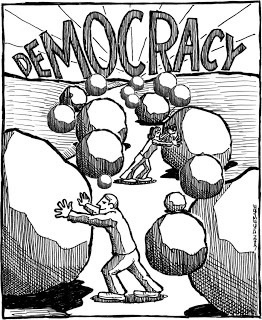 In fact, here’s what they thought democracy is: you only have to work three days a week, you will make anywhere between $100 000 to $1 000 000 per year (without paying taxes), and you get lots of free stuff from the government–woo hoo! But then I would explain the reality of high taxes, and the requirement to get government permits to do stuff on your own land which you don’t really own, and how hard people really do work, and that many people are in serious debt, and that the government is in serious debt, and the lack of real freedom for most people. Cambodia needs liberty and freedom, yes. But, democracy being introduced into this country by a guy who’s spent much of his life in France is not what this country needs. Just imagine the culture of corruption which already exists being combined with a European style democratic nanny state. And it’s laughable to think that democracy will eliminate corruption, it’ll just allow corruption to grow, especially when more foreign aid comes pouring in as a reward for the new democracy. Cambodia needs a government that will back off, limit its own power, reject foreign aid, and let the people prosper on their own. Cambodia needs help with this, absolutely. Help will come through non-governmental organizations and, infinitely more important, help will come from the Christian church. Cambodia will find its true freedom through local Christians and foreign missionaries working together to spread the Good News. The Gospel is pervasive, and it penetrates every crack, every dark place of a society. The Gospel brings true freedom as it brings people under the, very undemocratic, rule of Christ. This is a very realizable goal for Cambodia. Western style humanistic democracy will be one of its greatest obstacles, even more so, I’d say, than a brutal dictatorship would be. My prayer for Cambodia will continue to be that Jesus takes this nation as His own, and that Cambodia will worship Him alone and not fall for any false gods introduced from the west disguising themselves as freedom, or equality, or prosperity, or whatever.